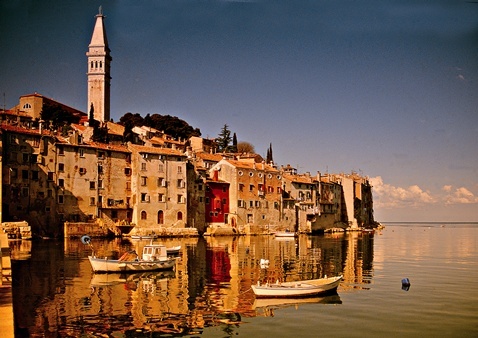 Rovinj is situated on a peninsula that was once a small island joined to the mainland only in 1763. Rovinj is a charming medieval town, the center of the ancient Mediterranean culture, tradition, gastronomic tradition, relaxing in the nature and the exploratory spirit. Were he a person, he would be cordial, warm, loving and eternal dreamer. The town is the center of southwestern Istrian coast, with an indented coastline adorned with numerous islets and reefs cover bathed by the crystal clear waters of the Adriatic sea. The beaches are covered with pebbles and some with white rocks. The underwater is rich in flora and fauna and the hinterland is covered with green pine forests. It has a tradition of fishing, socializing and smalltalk in the town squares, as well as in health and tourism, and card games in the shade of the old vines.